Freestyle BMX is growing increasingly popular. It appeals to youth, doesn't have to cost much, encourages active recreation, and is suitable for both rural or urban environments. Freestyle BMX riders need a legal place to practice and play, and skateparks are among the safest and best venues. Some skateparks deny access to bike riders, citing concerns such as liability, user conflict, and facility damage. At the same time, numerous skateparks have figured how to integrate biking and skating seamlessly. 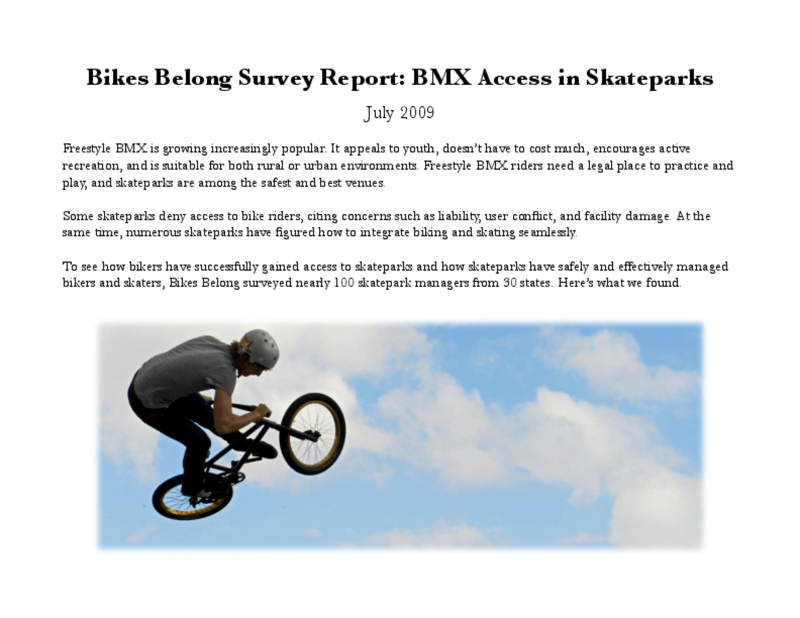 To see how bikers have successfully gained access to skateparks and how skateparks have safely and effectively managed bikers and skaters, Bikes Belong surveyed nearly 100 skatepark managers from 30 states. Here's what we found. 46% don't allow bikes, why not? According to the survey respondents, nearly all of these reasons for denying bike access come back to park design. Often, parks weren't designed for bikers because bikers didn't participate in the planning, fundraising and construction processes. Park managers are often open to reviewing their policy on bikes. But, nothing changes unless the bike community is well organized, professional and engaged. Some parks haven't considered allowing bikes because their insurance or park warranty banned bikes from the beginning. In these cases, it's the insurance carriers and park builders who need to be educated about the importance of making room for bikes. Copyright 2009 by Bikes Belong Foundation. All rights reserved.